Hibiscus Chose a site for planting that has good drainage, full sun and a source of steady water. Soil needs to be slightly alkaline and fertile. 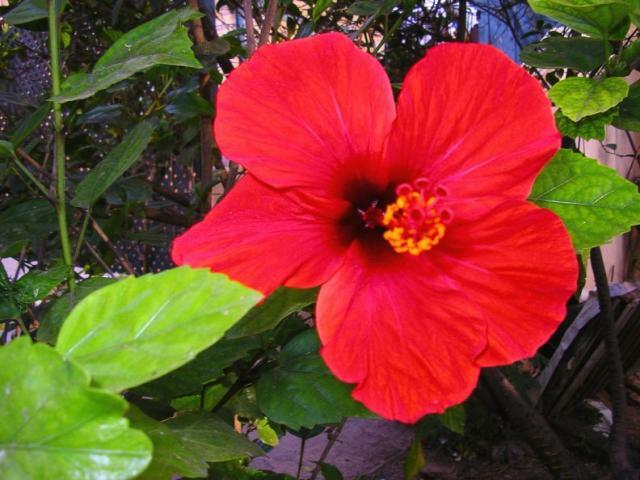 Plant the hibiscus by digging a hole twice the size of the root ball. Center the plant in the hole and cover. Water thoroughly to remove any air captured around the roots. Provided the soil is fertile, little or no fertilizer is needed. Mulch heavily around the base of the plant to help retain moisture, but keep the mulch approximately 3 inches from the trunk of the plant. Prune the hibiscus during the winter to encourage growth the following year. Use a liquid insecticide soap to spray the plants for its common adversaries: ants and aphids, spider mites, white fly and mealy bugs. Should a fertilizer be needed, small amounts of a balanced blend with trace minerals should be used. The hibiscus plant should be protected from wind and ice during the winter months.